Ancient temples—built from the 6th century BC until the 2nd century AD on mainland Greece, the islands, in Asia Minor and Greek colonies such as Sicily and Italy—are some of the best testimonies of ancient Greek architecture. These structures, dedicated to a specific god, were built to house impressive statues of the deity, while offerings were made outside. Though many of them are now in ruins, there are a few ancient temples still standing that will certainly transport you to another era. Here are the most beautiful temples you will see in Greece. 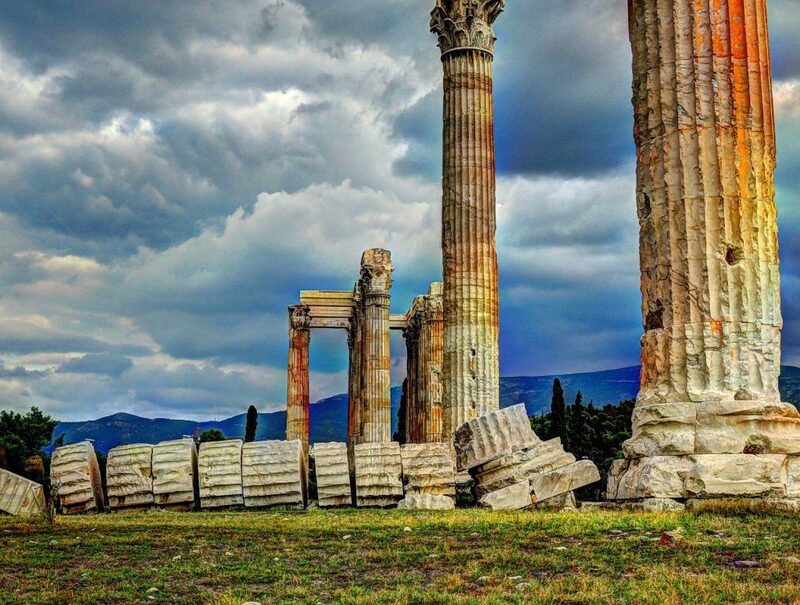 Known as the largest temple in Greece, the Temple of Olympian Zeus, or the Olympeion, was built in the 6th century BC, though it was completed roughly 640 years after in the 2nd century AD, thanks to Emperor Hadrian. During the Roman era, the temple included 104 grand columns, of which 16 still stand today. The temple, located approximately 500 meters (1,640 feet) southeast of the Acropolis, is in the center of Athens and is part of an important archaeological site, enclosed by Hadrian’s Gate. 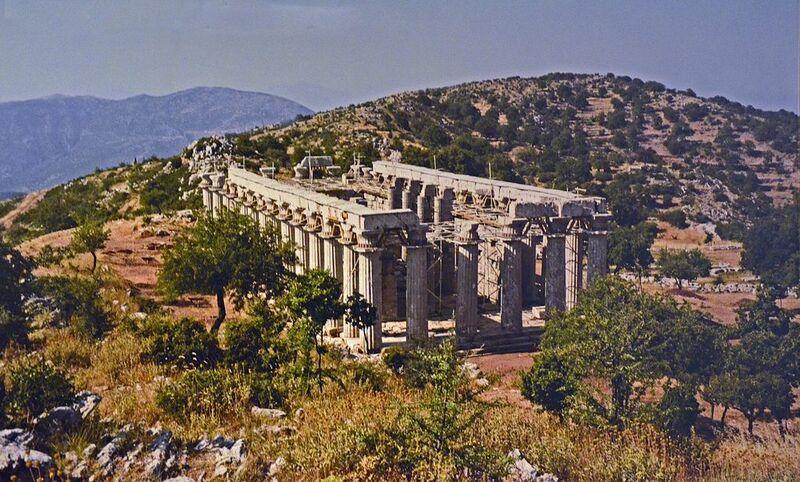 One of the most underrated temples in Greece, the Temple of Apollo Epicurius, or Epikourios, is hidden on a remote mountain in Peloponnese near Bassae, or Vasses. Its isolation is what most likely contributed to its preservation, as it is one of the few temples that escaped being destroyed by war or reconverted into a Christian temple. It is one of the most studied temples as it features examples of all three architectural orders. The temple, which was the first site in Greece to be inscribed on the UNESCO World Heritage List in 1986, was constructed sometime between 450 and 400 BC and sits at an elevation of 1,131 meters (3,711 ft) on the slopes of Mount Kotylion. Undeniably one of the top excursions you can take when staying in Athens is a visit to the Temple of Poseidon at Cape Sounio (or Sounion). This Doric-style temple was constructed around 440 BC on the southernmost tip of the Attica region, and it is dedicated to the god of the sea, Poseidon. In a sea-faring nation like Greece, this temple was one of the most important, and individuals, as well as city-states, would come to bring sacrifices and offerings to call on the god to ask for safe travels. This temple perched on top of a hill is dedicated to the goddess Aphaea (or Aphaia), a deity almost exclusively worshipped on the island of Aegina in the Saronic Gulf. 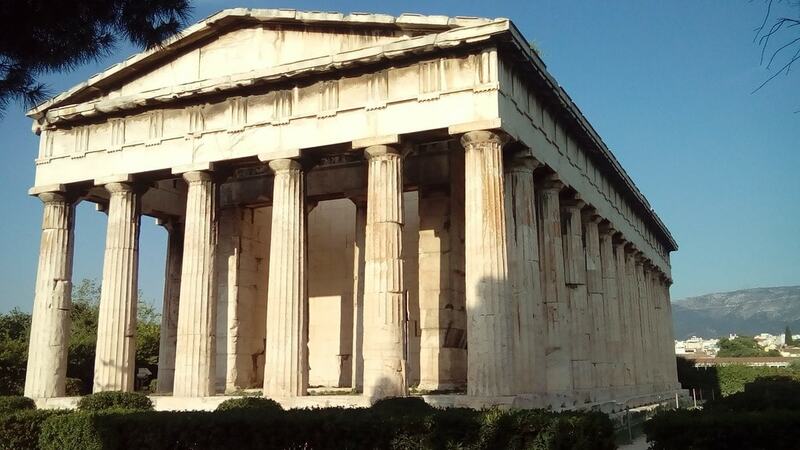 One of the ancient architectural wonders of ancient Greece, the temple was built in 480 BC, and today, 25 of the original 32 Doric columns still stand thanks to the hard work of restorers. As early as the 14th century BC, it appears that goddess Aphaea was a local deity associated with fertility and the agricultural cycle; however, under Athenian hegemony, she quickly became identified with the goddess Athena, which is why some call it the temple of Athena Aphaia. The Erechtheion (or Erechtheum), built between 421 and 407 BC and nestled on the northern side of the Acropolis of Athens, is a temple of the Ionic style. Named after a shrine dedicated to Athenian hero Erichthonius, the temple, built by architect Mnesicles, was dedicated to Poseidon Erechtheus and Athena Polias, defender of the city. The temple is one of the most famous thanks to its southern porch, supported by six caryatids, sculpted female figures serving as architectural support. One of the most overlooked temples in Athens, the Temple of Hephaestus, designed by Ictinus (or Iktinos) and built in the 5th century BC with marble from Mount Penteli, stands near the Agora of Athens. One of the best-preserved Greek temples in the world, it was dedicated to Hephaestus, god of metalworking and fire. It served as an Orthodox church from the 7th century until 1834. Located in the archaeological site of Delphi, in Central Greece, the tholos at the sanctuary of Athena Pronoia is a circular temple constructed between 380 and 360 BC. It comprises 20 Doric columns around its exterior and 10 Corinthian columns in the interior, though only three of them remain. Also known as the Heraion, the Temple of Hera in Olympia is an excellent example of ancient Archaic architecture. Dedicated to Hera, the queen of gods, the temple was erected around 590 BC, though an earthquake destroyed it in the early 4th century BC. The temple used to store items important to Greek culture as well as other offerings of the people, but today, it is where the torch of the Olympic flame is lit every four years. A powerful city-state on the Isthmus of Corinth, halfway between Athens and Sparta, the ancient city of Corinth was home to a Doric-style temple dedicated to Apollo. The temple is actually a great example of a peripteral temple (one with a portico made of columns) and was supported by 38 columns, though today, only seven are still in place. 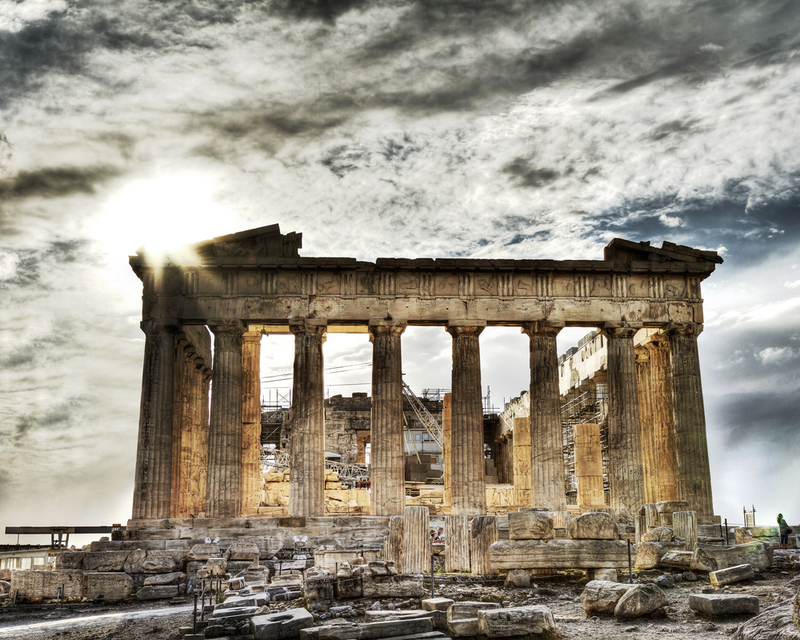 Undeniably the most famous of ancient Greek temples, the Parthenon, dedicated to goddess Athena and perched on top of the Acropolis in Athens, is one of the most popular tourist attractions in the country. Constructed in 447 BC to replace an older temple, the Parthenon was meant to house a spectacular statue of Athena, but the sculpture was looted and brought to Constantinople and destroyed. Since its construction, the temple was used as a fortress, a mosque, and a Christian church dedicated to the Virgin Mary. Don’t miss the chance to see it the next time you visit the Greek capital.